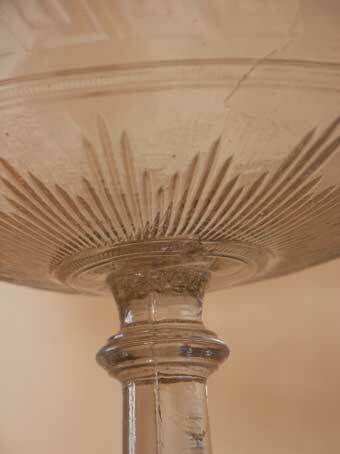 As we have seen, the glass press made its entrance in the 1830ies: first Reijmyre, then Skönvik, Kosta... Soon there were presses on many glassworks. There were experiments with different types of presses, different materials for moulds. Strömberg (Kostaglaset 1742-1916) writes about ceramic moulds, moulds made of brass and, later, iron. Considerable skill was needed to get a "good" product out of this mould, ie that the glass filled every cavity of the mould - the melt had to be fluid (hot) enough, but not too hot, because too hot glass tends to stick to the mould. The mould itself had to be pre-heated to the optimal temperature. 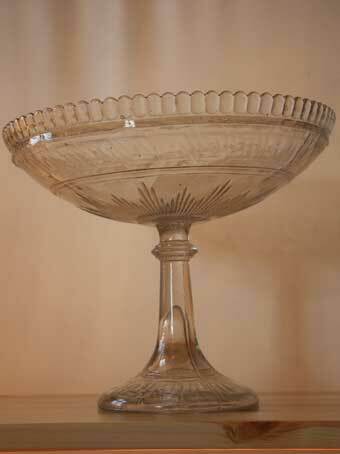 All moulds were not complex: the fruit bowl below is made in a two-part mould. The bowl and the stem were made in one piece. 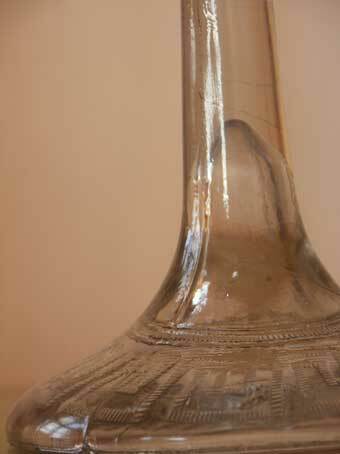 On the right-hand picture the seam of the mould is clearly seen on the stem. The next example is also made in simple moulds: the bowl is made separately, as is the stem - next, the two parts have been joined "hot". 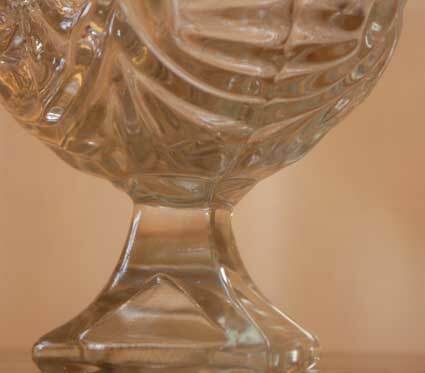 This bowl is an example of a bad product: the glass is bad (bubbles, threads and other faults), the join between bowl and stem is ugly - but it is easy to see how it is made. Here you can read about the two presses we show in the museum. I found a vides showing comtemporary hand pressing. They make a bowl, that can be used "as is", but it can then be flared into a dish. 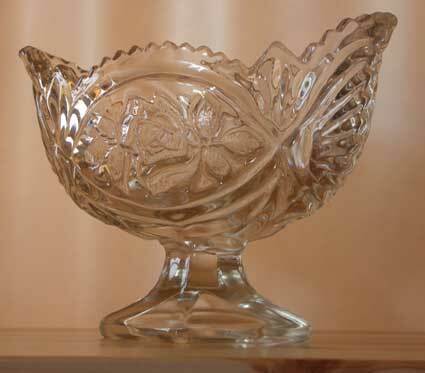 The dish can be swaged and can get a handle added, making it into a "candy basket".